This piece has 2 segments. First is the news report on ‘Bizman Ties Apprentice for 10 Days without Food in Lagos’. The second is ‘Africans In America organization’s Response’. When they succeeded in gaining entry into the building, they were shocked to see a 23-year-old boy, tied hands and legs and dumped like an animal in one corner of the room. He had bruises all over his body and his head was smeared with caked blood. They quickly rescued the poor boy and while searching the house, they saw a female teenager who claimed to be a relation to the wife of his master and they took all of them to their station for questioning. He said his master later started questioning him about their sales the previous day and he explained everything to him. “He complained that about N4,000 was missing from a sale of N28,000 we made but I explained everything to him yet, he insisted that the money was missing. Later, I went into my room. New York----Africans In America, Inc. response to this news article was delivered by Bonaventure Ezekwenna, the Executive Director of the group. “Africans In America, Inc., an organization committed to addressing issues affecting African immigrants in United States is outraged at the developing news of what happened to this young man named Thankgod Nwabisi, age 23, in Lagos, Nigeria. We have contacted relevant people in Lagos to confirm the incident. 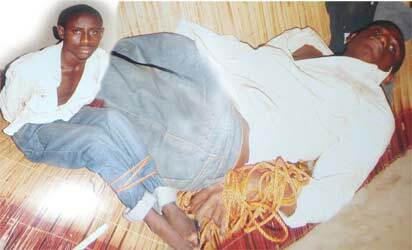 This young man is clearly a victim of internal human trafficking in Nigeria. “Enough study has not really been done to determine the origin of this practice and why it is mostly common among some ethnic groups in Nigeria. “But what is indisputable is that, the practice is a form of gross ruthless exploitation of the very poor and less privileged youths in the society by the more affluent people and businesses. And many victims have worse outcomes than this 23 years old ThankGod Nwabisi. Luring of teenagers and youths from remote villages in rural areas of Nigeria with promises of business skill training and pay (settlement after 4 or 5 years) only to subject them to gross physical abuse, financial exploitation and emotional/psychological dehumanization are form of human trafficking. Study has indicated that victims are sometimes used for human organs and human sacrifice for fetish purposes. “Let’s make no mistake about this: this practice is not culture, custom or tradition of any ethnic group in any way shape or form. Some perpetrators of these sorts of crimes against humanity and their associates have been trying both in Nigeria and outside of the country to justify these crimes as part of Nigerian ethnic cultural, customary and traditional practices. But our position, our organizational position has consistently been that these are crimes against humanity and should be treated as such. “These sorts of crimes have been going-on unaddressed, in Nigeria and around the world for a very long time until very recently. It is only recently that Nigeria law enforcement and justice system recognize it and hence started to address it, thanks to the works of Nigerian National Agency for The Prohibition of Traffic in Persons (NAPTIP). “Haven said that, NAPTIP needs to devote more resources and aggressively address the out-of-control issues of young apprentice abuse and exploitations currently going on in Nigeria. “Based on our experience here in New York, the people that assist this poor victim may get hostile attacks from associates of the perpetrators. We hope that both federal and state governments including law enforcement agencies in Nigeria would do everything possible to protect the victims and people who come to their aide from all sorts of attacks. “We hope that public awareness has sufficiently heightened so that gross physical abuse, financial exploitation and emotional/psychological dehumanization of apprentice youths in Nigerian and other African nations will get appropriate attention and be made to cease. “We are very proud of the level of awareness our (Africans In America, Inc.) work has created and heightened, not just in United States but around the world, despite danger and hostilities from associates of human trafficking syndicates and their contacts in Nigerian governments and beyond. “Hostility from associates of human trafficking syndicate convicted and imprisoned in United States explains the problem we have with former governor of Anambra State, Dr. Christopher Nwabueze Ngige (aka, Chris Nwabueze Ngige). “Hostility from associates of convicted and imprisoned human trafficking syndicates opposed to our work, who include Ngige relatives in United States, explains the reason Ngige committed the silly blunders during his visit to New York in October 2004. “Associates of convicted and imprisoned human trafficking syndicates and others opposed to our work influenced then Governor Ngige not only to insult our group during his visit to New York, but to deploy machinery of his office in attempt to blackmail, tarnish and misrepresent our work in United States and that is where we draw the line on his recklessness. That is where we decided to hold him accountable. “Reckless Nigerian Gov. Christopher Ngige had his senior press aide unleash press attack on our organization as a covert and overt show of solidarity with associates of convicted and imprisoned human trafficking syndicate. And for that, we decided to hold his executive recklessness in check. 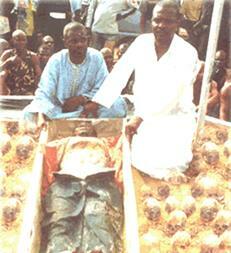 From left: exhibits of Okija fetish shrines, dead body and human skulls, part of over 70 dead bodies and hundreds of human parts openly displayed on the surface, recovered by Nigerian police from shrines after Governor Christopher Ngige (aka, Chris Ngige) and his group admitted going there at about 2.00 a.m. to perform oath of obedience/loyalty rituals. After their midnight visit to the shrine, Chris Ngige later quarreled with his groups that made him governor. They master-minded his kidnapping on July 10, 2004. After he was rescued, he retaliated by exposing how he plotted with them to loot the treasury of Anambra State and how he later changed his mind. 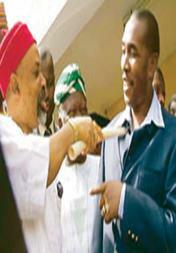 His group which included a federal lawmaker Hon. Chuma Nzeribe retaliated by revealing that Gov. Ngige was a regular customer to the deadly shrines and further revealed that Gov. Ngige drove the group in his own car to the shrines at 2.00 a.m. midnight to perform oath of obedience/loyalty rituals. The lawmaker then requested police to quiz Gov. Ngige regarding dead bodies in the shrines. That was how Ngige and his group publicly implicated each other on the atrocities (the rituals, dead bodies and human parts) found in that shrine. Nigeria is one of the African countries where influential people slaughter human beings for fetish ritual purposes including quest for political power, wealth and fame. Center: Anambra State Governor, Dr. Christopher Nwabueze Ngige (aka, Dr. Chris Nwabueze Ngige) and his associates that rigged him into office; shortly after rigging him into office, the same group considered him disloyal and master-minded his abduction in a failed bid to remove him from office.